Ubuntu is one of the most Favorite Open Source free Operating System with lots of features Like Network Connectivity Most of the Servers are Linux Based because they gives great Security and Connectivity. Ubuntu for Android Mobile workers a compelling reason to Upgrade their handset because every time moving with desktop is impossible so this Ubuntu for Android gives easy connect with your desktop PC. Ubuntu desktop is easy to use and that’s one reason why Ubuntu is now the world’s favourite free operating system. More then 50% of all Linux developers use Ubuntu. Ubuntu for Android comes with full range of desktop application for mobile such as web browsing, Office, emails and messages. 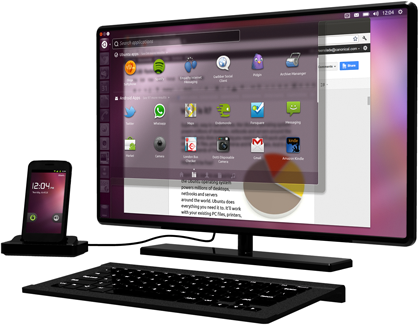 Ubuntu for Android wants to bring Desktop world with your portable smartphone together. The best thing about Ubuntu is their security for applications. Ubuntu and Android uses same Kernel and when Ubuntu is docked, Ubuntu OS boots and start running concurrently with Android OS. This allows us to get synchronized between Desktop and Mobile. CPU cores are only used when Ubuntu OS is docked and if Ubuntu is not used then whole CPU Core power is transfer to Android.